A sixth generation Charlestonian, Jan Pearlstine was living in Washington, DC when she met her future husband Larry Lipov. Returning to Charleston to run the family business, Pearlstine Distributors, Jan and Larry initially relocated to Mt. Pleasant. After the birth of their first child they decided to return to the neighborhood Jan grew up in. Working hand in hand with architect G.M. (Skip) Wallace, Jr., owner of Island Architects in Chester, Virginia, it took two years before Larry and Jan’s dream home became a reality. “Working with Larry and Jan was a lot of fun. They were open to new innovative things and that was refreshing. It was an unusual project, limited in many ways by the original home’s footprint,” recalls Wallace. The Lipov’s love of family and friends along with their many philanthropic interests factored into all design decisions. “We use the house to promote good in Charleston. From children’s events to Jewish functions to the Charleston Symphony, we constantly open our doors for fundraisers and other gatherings,” says Jan.
Top: Mexican limestone tiles create winding paths through seasonal blooming plants and shrubs. 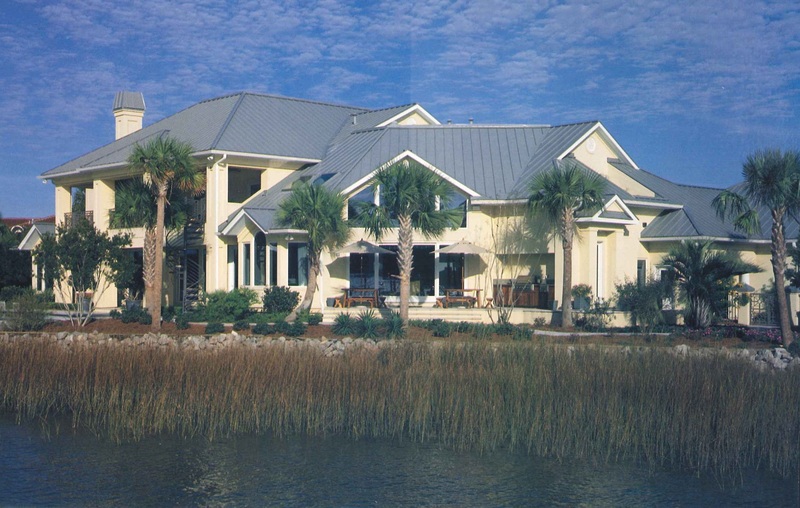 Landscape Architect Robert Chestnut’s design complements the natural beauty of the Intracoastal Waterway. Bottom: A desire to recreate a “Sullivan’s Island” look, the upstairs verandah has a beadboard ceiling, wainscoting, comfortable wicker and teak furniture. Rick Avery wrought iron railings and a spiral staircase leading to the pool. Artwork and curios discovered locally as well as from all over the world are effortlessly displayed lending to the overall charm and whimsical nature of the home and grounds. A fish lounge chair, an aluminum bench designed to resemble someone doing a back flip, and metal bar stools with faces, are just a few of the fun and unusual pieces found on the many porches, verandahs and poolside. Perched on the banks of the Intracoastal Waterway and complete with a pool, it’s easy to see why their son Edwin and daughter Halle are true “water babies.” In the summer when the Lipov’s host swimming lessons it isn’t unusual to have 50 children splashing in and around the pool. With that in mind, a special pool area was created inside between the garage and kitchen. Cubbies full of brightly colored beach towels, cabinets for guest’s personal belongings and a separate refrigerator full of drinks and snacks is across the hall from a full bath featuring Shirley Kratz hand-painted tiles. In the main hall leading from the garage, Jan decided against the traditonal coat closet instead creating a wall of lockers. “With coat closets, stuff gets pushed to the rear and lost; individual lockers allow each person their own personal space,” Jan remarks. Another sensible idea is the two separate laundry rooms; one upstairs and one downstairs near the pool. A gift-wrapping station and drip basin for wet swim-suits located in the downstairs laundry fall into that “why didn’t I think of that” category. The original home had low ceilings which the Lipov’s raised to pay homage to the spectacular panoramic view. Offering access to the outdoors from each room, the kitchen, breakfast nook, living room and bar area has a vast expanse of glass casually draped with sheer silver fabric creating proper feng shui. “The main concept for the house since it is on the water, was being able to intergrate inside and outside,” says Wendy Marcus Goer, owner of Marcus Goer Interiors, Inc. in Charleston. Larry loves to cook and can often be found in the warm teal, bright yellow and purple kitchen inspired by Manual Canovis fabric featuring tulips and daffodils that drape the breakfast nook windows. “Jan is very innovative and had definite ideas on her color combinations,” notes Linda McLain, of Signature Kitchens and Baths of Charleston, Inc. Tay wood cabinetry was finished with a high gloss aniline dye that captures color while still allowing the beauty of the wood to come through. Stainless steel appliances and hardware were added for contrast. Gray granite is used as flooring through out the downstairs to blend and accent the vibrant color palette. From the kitchen and breakfast area into the bar and living room resplendent in bold reds, yellows, purples and greens it is easy to imagine casual brunches as well as catered black tie cocktail parties being hosted on a regular basis. A Blue Eyes granite topped bar with comfortable, colorful chairs and glass shelves displaying the Lipov’s collection of Anheuser-Busch memorabilia reflect the nature of their business. The round remote control gaming table with Italian Pace chairs can be raised or lowered for dining or playing a friendly game of cards. In the living room an electic mix of furniture, family photos, fabulous artwork, objet d’art, and inherited treasures, including an antique silver tea set, which belonged to Jan’s great-grandmother, creates a room bold yet inviting. Located in the soaring entry hall a free floating curved staircase with open risers and acrylic panels lends itself to the extreme open floor plan and magnificent view. Defining the main dining room are silver graduated columns capped with mahogany bands. A Mona Lisa portrait and rich red credenza originally owned by Jan’s late mother are the focal points of this room. Two glass topped tables each seating eight are perfect for the rectangular space. “The two tables side by side make for easier dinner conversation than one single long table,” states Jan. A master craftsman from Chicago was commissioned to create the additional pieces in the dining room as well as the wet bar and living room built-ins. 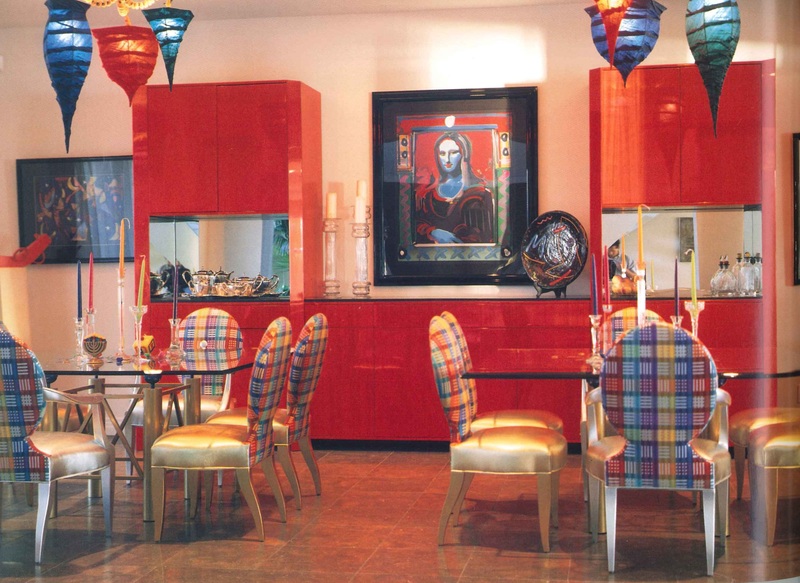 Above: Unique papier-mache and rope chandeliers coordinate perfectly with the rich red custom credenza and colorful fabric chair backs. Alternating gold and silver chair seats harmonize with glass topped silver table bases and glass accessories. Across the hall mahogany pocket doors inset with Charleston artist Robert Hines stained glass lead into the state-of-the-art media room. From the surround sound media center to the comfortable relaxing black and red leather furniture resting on a cream wool rug with black leather squares, this is the perfect gathering spot for family and friends. Above: The custom crafted obeachy wood media center has been finished with an interesting trio of ceiling mouldings. This triple moulding effect has been used in different patterns throughout the home. 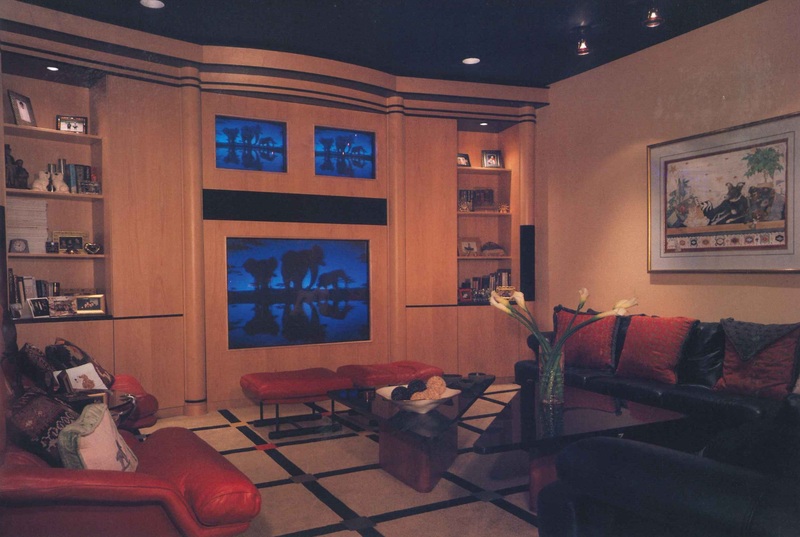 Giving the media room a true “theater feel” is the black ceiling with spot and recessed lighting. Emanating subtlety and sophistication with unexpected bursts of color, the master suite is a restful retreat yet continues to showcase Jan’s love of color. Soothing greens and muted golds commingle with royal purple accents. A raised fireplace flanked with lighted deco glass blocks is steps away from the outdoor hot tub. Original eight-foot ceilings visually soar with creative cuts hued in deep purple. Purple cabinets in the master bath had Larry thinking twice about Jan’s color selections while the limestone floor has deep purple, emerald green and topaz colored glass blocks randomly placed. Jan initially wanted lighted glass blocks until Larry told her she would be responsible for going underneath the house to change the bulbs. The second level is home to the children’s bedrooms each with private bath, two guest suites, family office and spacious playroom/exercise room with a second staircase leading down to the kitchen. Sweeping verandahs featuring cozy sitting areas perfect for dolphin watching or enjoying a good book are accessible from all upstairs rooms. 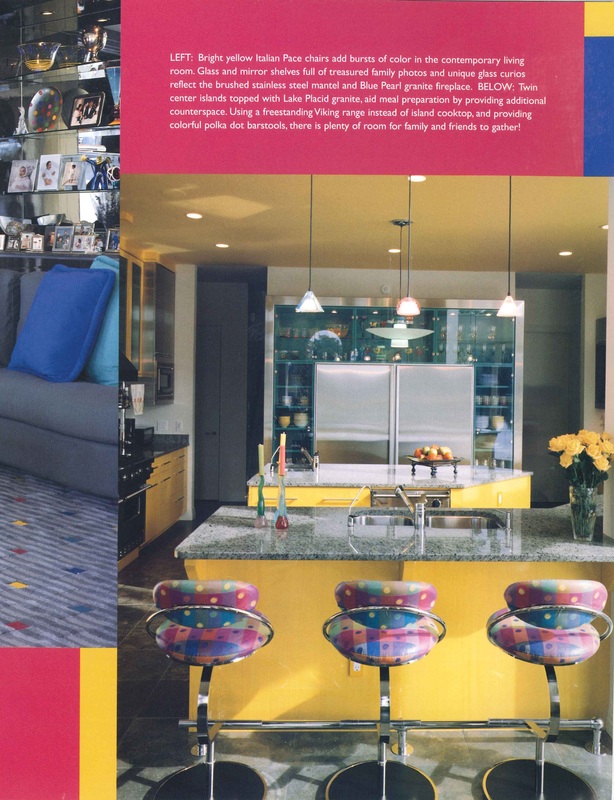 Originally traditional and now boldly sculpted, Larry and Jan’s home truly reflects their love of family, their sense and commitment to community and their pure enjoyment derived from a home that is creative, comfortable and colorful. This entry was posted in Charleston Living & Home Design, Magazine Articles and tagged Charleston Living & Home Design, Charleston SC, Charleston Symphony, Chester VA, Island Architects, Jan Lipov, Larry Lipov, Lee Ann Carter, Linda McLain, Manuel Canovis, Marcus Goer Interiors, Mt Pleasant SC, Pearlstine Distributors, Rick Avery, Robert Chestnut, Robert Hines, Shirley Kratz, Signature Kitchens and Baths, Skip Wallace Jr., Solaris Inc, Steven Brenner, Wendy Marcus Goer on May 23, 2012 by Lee Ann Carter.